New York City. Nov. 14, 2018. 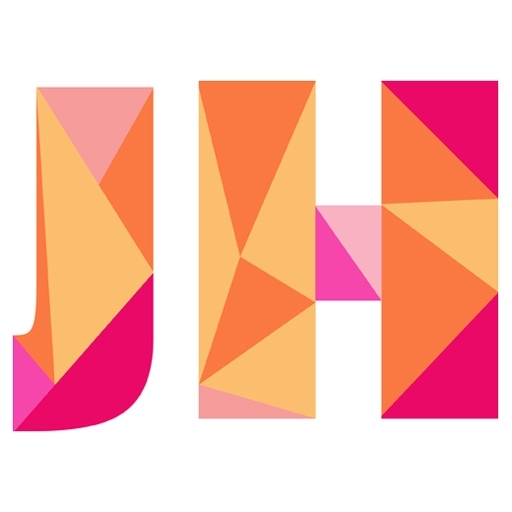 Hana was a natural choice for the name of the latest jewelry collection from Seattle-based designer Erika Winters, given her DNA, professional history, and the word’s meaning. “Hana” means “one” in Korean—a nod to her mother—and reminds Winters of the “back to one” commands she received from directors in her past life as an actress. It’s also a direction she ruminates over repeatedly, like a mantra (think back to an original place or essence). The silhouette in Hana, a blend of an octagon and a trapezoid that the jeweler calls a trapagon, is simple, striking, and the focus of all Hana styles. 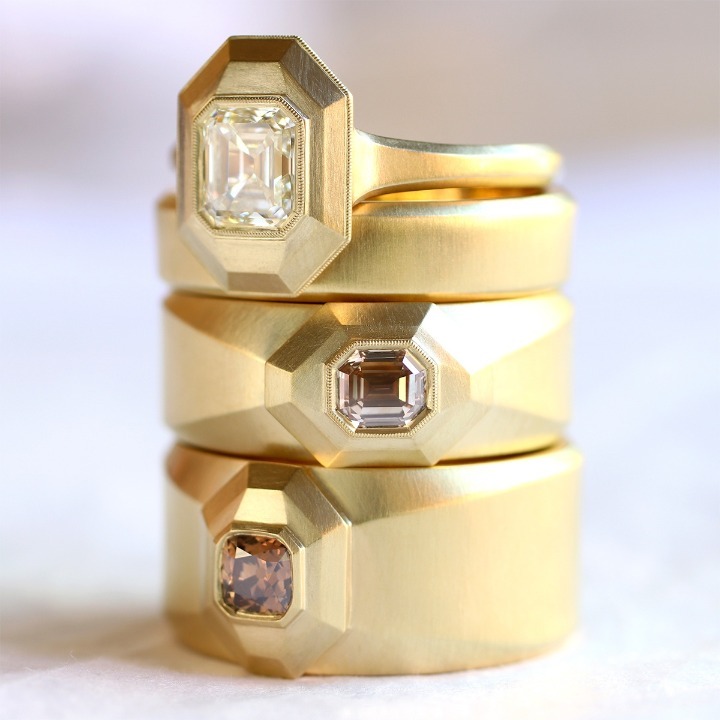 A trio of diamond rings from Erica Winters’ Hana collection. As shown, rings range in retail price roughly from $7,200 to $10,800 with diamond center stones. Email erikawinters@gmail.com for purchase. 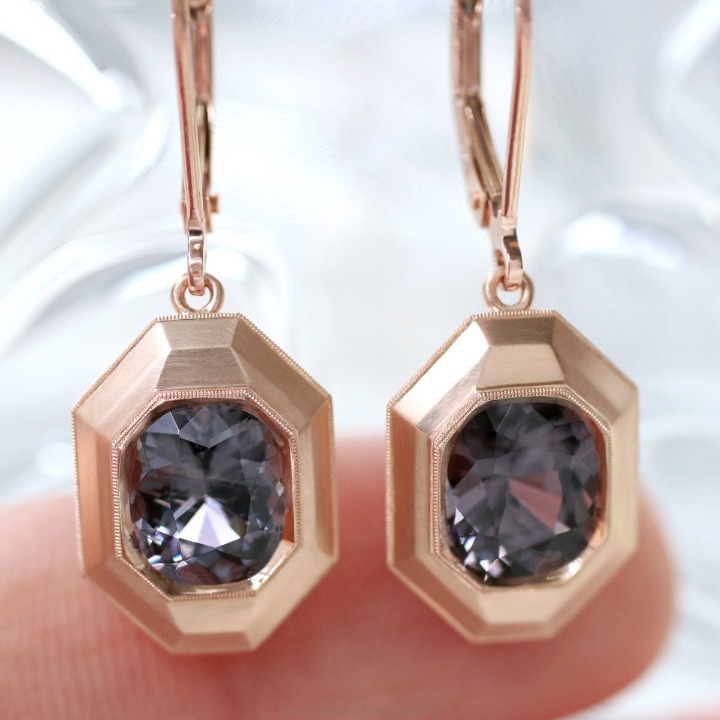 Hana earrings in 18k rose gold with gray spinel start around $6,400. Email erikawinters@gmail.com for purchase. The shape transports Winters to a mental place filled with ancient Eastern and Middle Eastern concepts, shapes, and architecture as well as ziggurat structures and Korean jewelry. That’s because Winters’ mother was the impetus for Hana. In 2015, her mom—a tough woman who pushed her daughter to strive for excellence—told the designer that she wanted a ring featuring her daughter’s birthstone, emerald. So Winters went to work sourcing one, a stunning vivid-green number, of good size and lightly oiled. “I don’t get to buy an emerald like that often,” she says of the treasured gem. The emerald Hana ring Erika Winters made for her mom. This piece is not for sale. But at the time she purchased the stone, her mother was diagnosed with cancer and given just six months to live. Hospice quickly entered the picture, but Winters’ mom—ever loving but a demanding figure who bluntly delivered requests—insisted her daughter speed up her piece’s production. “She said, ‘You better hurry up and make something,’” Winters recollects. 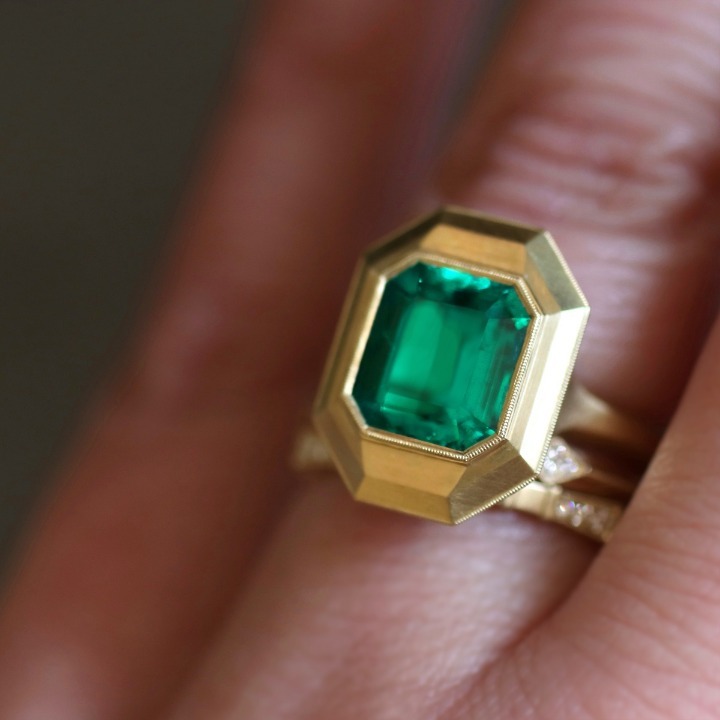 Dutifully, the daughter did so, creating her mom’s ring and planning for future Hana styles to feature only cushion and emerald cuts with the surrounding metal bezels playing out the Hana shape. “It’s all bezel settings—more pared-down ones,” she says. 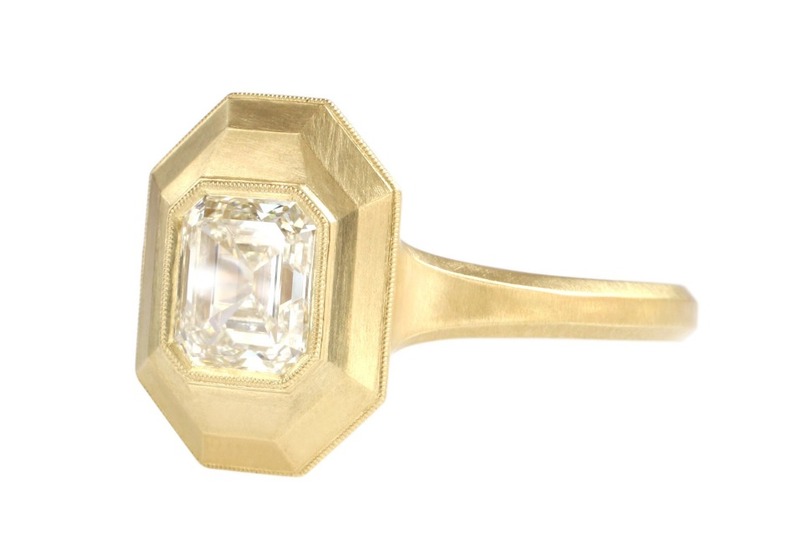 Hana engagement ring with a colorless emerald-cut diamond retails for about $10,800. Email erikawinters@gmail.com for purchase. When Winters’ mom died in 2015, the designer shelved the line. A year later, she debuted five Hana styles—including her mother’s emerald ring, which isn’t for sale—at the 2017 Couture Jewelry show. Since Winters is known for diamond styles, the ring garnered much attention as well as a few orders from stores. 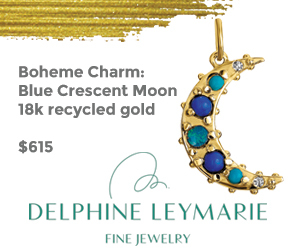 Complete styles—center stones and mountings—are made in 18k gold or platinum and start around $4,500 retail for gold. 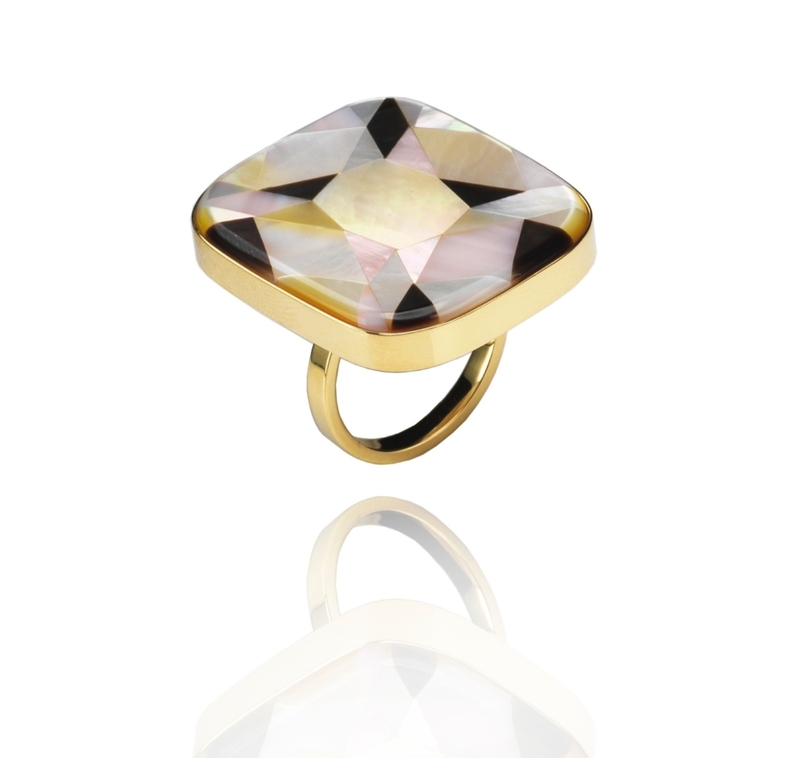 And though Winters is known as a wedding-ring designer, Hana translates effortlessly into fashion looks with colored-stone centers. 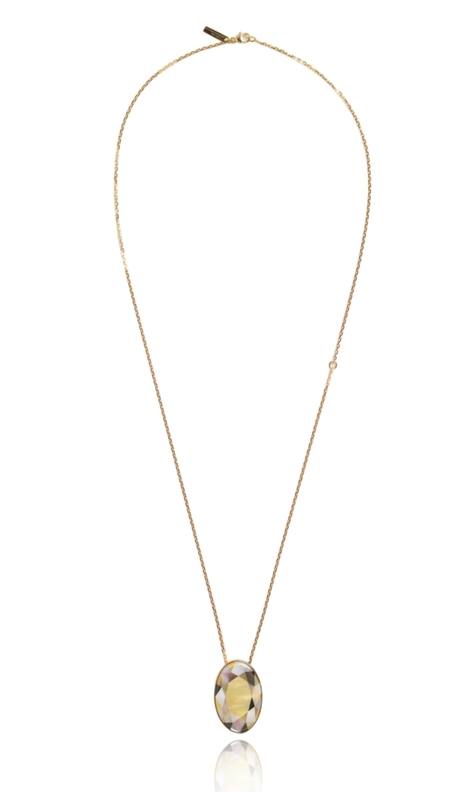 The nearly five-year-old jewelry brand is also diversifying into other styles, such as necklaces. One piece with a Hana motif on a split chain sits in the hollow of the wearer’s neck, offering a “timeless and ancient yet futuristic vibe,” says Winters, while a nearly 6-carat smoky, lavenderish-color spinel style will offer a blingier look. New York City. Nov. 8, 2018. 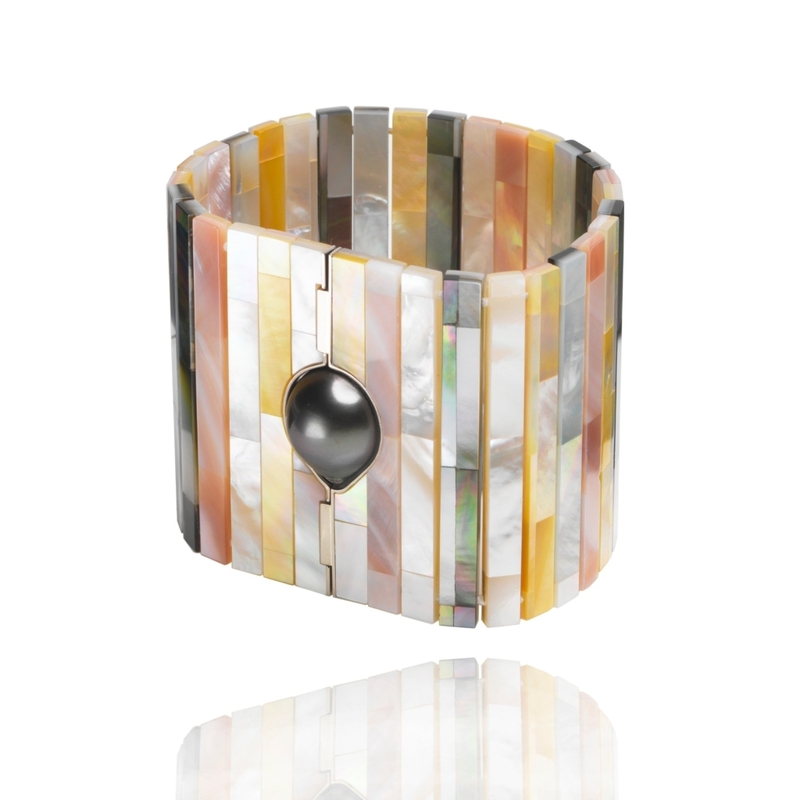 It was 10 years ago when London-based jewelry designer Melanie Georgacopoulos first felt a little sorry for the underrated and often neglected gemstone material mother-of-pearl. 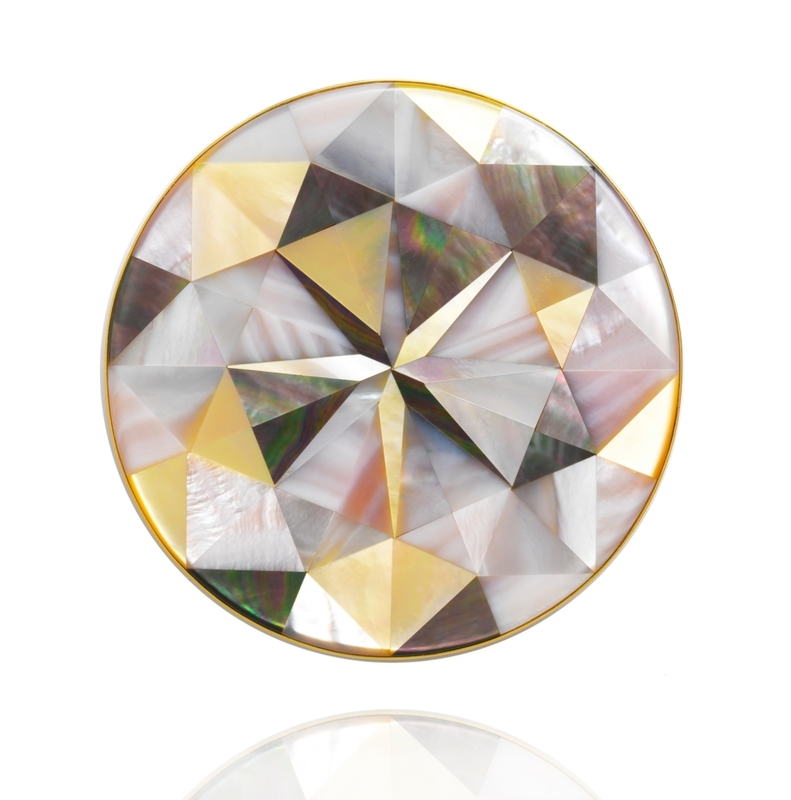 She brainstormed, and the result is her Gemstone collection of 13 mother-of-pearl jewels that mimic popular diamond cuts in two-dimensional form. For example, the Cullinan I—the largest gem-quality rough diamond ever found, weighing 3,106.75 carats—is represented in one of her larger (6 cm) “gemstones.” Each comprises as many as 72 individual sliced and matched mother-of-pearl pieces that are precisely cut, filed, and polished before being assembled into 18k yellow gold bezel-set pendants, earrings, rings, and brooches. Shells used include South Sea, golden, and Tahitian oyster shells as well as pink and white freshwaters. Akoya shells are noticeably absent. “They’re too small and not thick enough to use,” explains the artist. 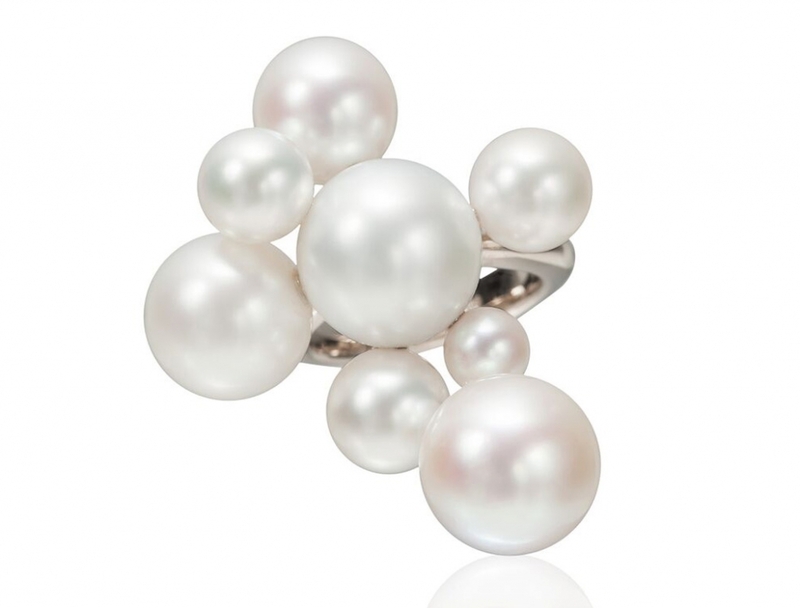 The limited-edition offerings also represent a natural progression from Melanie’s ongoing examination of the pearl as well as a groundbreaking appearance for the little-celebrated shell material. “It’s a tricky process but one that makes you feel very proud once you finish,” she says. Upon reflection, Georgacopoulos doesn’t want to inspire false hope in a future for the look. “These were so hard to make, I won’t make them again,” she concedes. Collectors should take note: don’t look for these jewels in stores. Reach the artist directly to purchase these one-of-a-kinds. Retail prices start at £2,800. NEW YORK. By the time Assael’s Bubbles collection debuted at the Couture jewelry show this year, Assael designer Sean Gilson had created many iterations of it. “The most recent pieces are the natural progression of that evolution,” he explains. While his priorities for the look were beauty and wearability, the inspiration—surprisingly enough—does not originate from light-hearted child’s play. Instead, it hails from a onetime serious conversation about surface tension and bubble formation with Finish-American jewelry master Heikki Seppa, who died in 2010. Pearls by nature have “variation and nuance that fit neatly into simple forms made into complex shapes” explains Gilson. 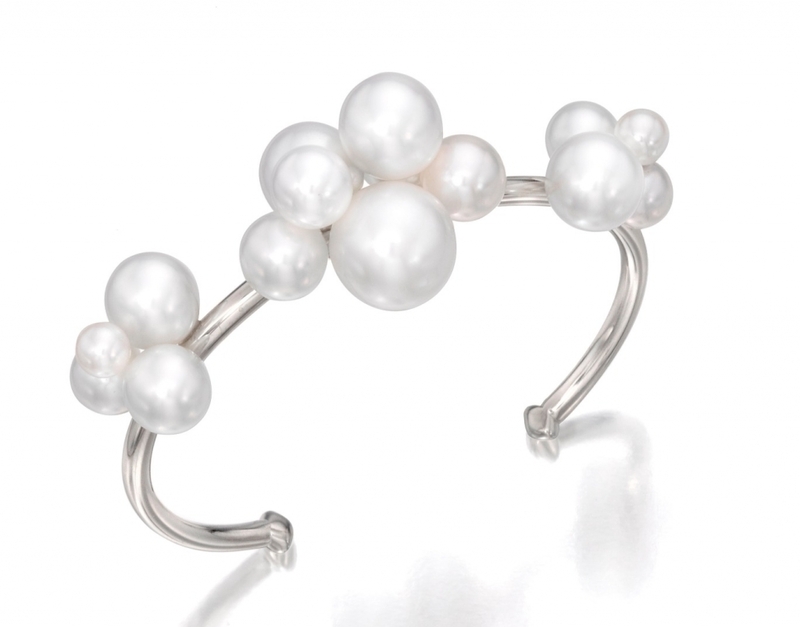 Bubbles pieces also demonstrate the strength of pearls as a “standalone gem” without diamonds (America’s favorite stone), says Peggy Grosz, director of business and product development. For sure, Bubbles is a response to dated pearl jewels that should be simple and relevant to style today while also being timeless to eliminate their stodgy perception. 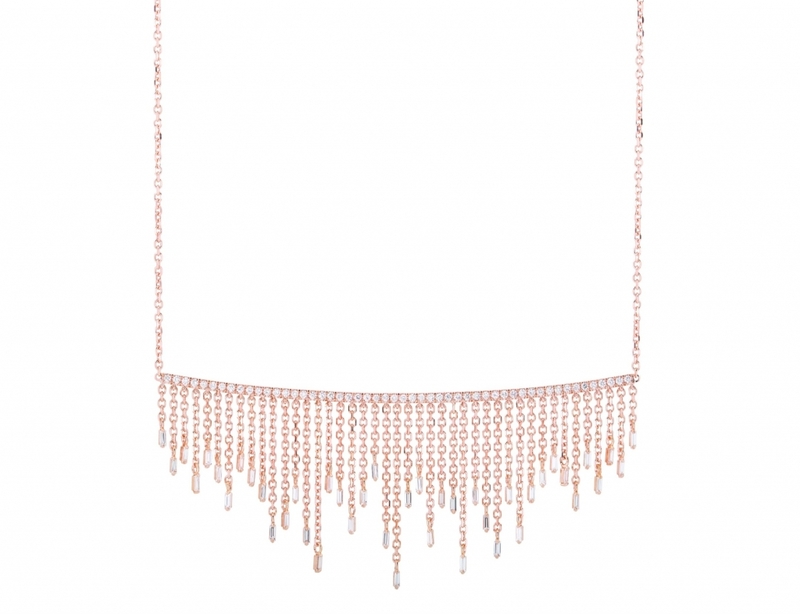 “Bubbles are a perfect embodiment of classic but innovative jewelry,” says Gilson. 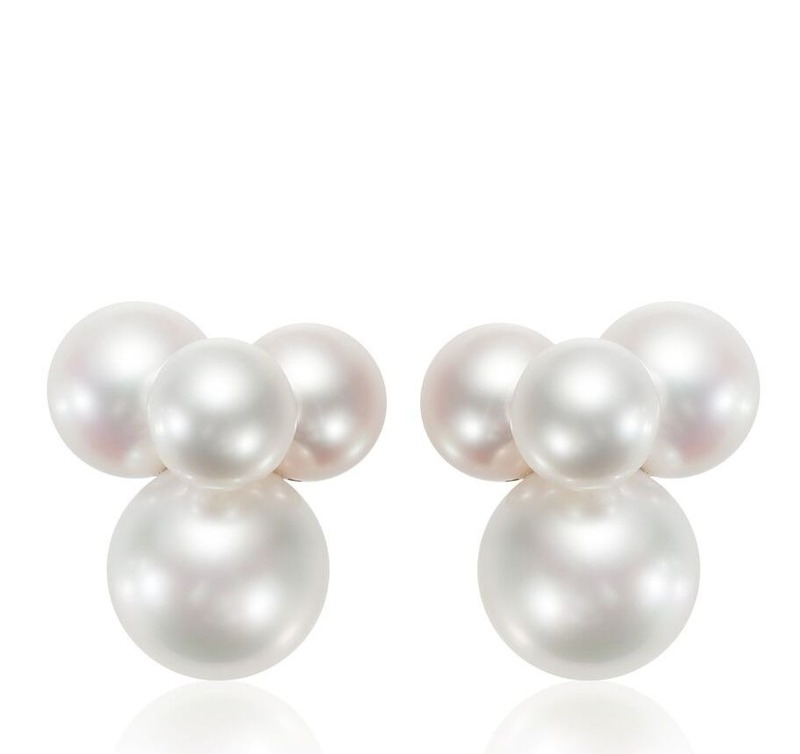 The ultimate challenge was to create a young, sophisticated look with tried-and-true white pearls that have long suffered a Barbara Bush stigma (think grandmother’s pearls). The reaction thus far? Goals accomplished—Bubbles is a hit among many! Next up, Tahitians will join this playful collection. Look for them later this year. NEW YORK. Suzanne Kalandjian of Suzanne Kalan knows a good thing when she sees it. So, when the northern California-based designer debuted her Fireworks collection of diamond jewelry (a variant of her Vitrine offerings) six years ago and saw how quickly it accumulated admirers, she decided to keep it going with add-ons. 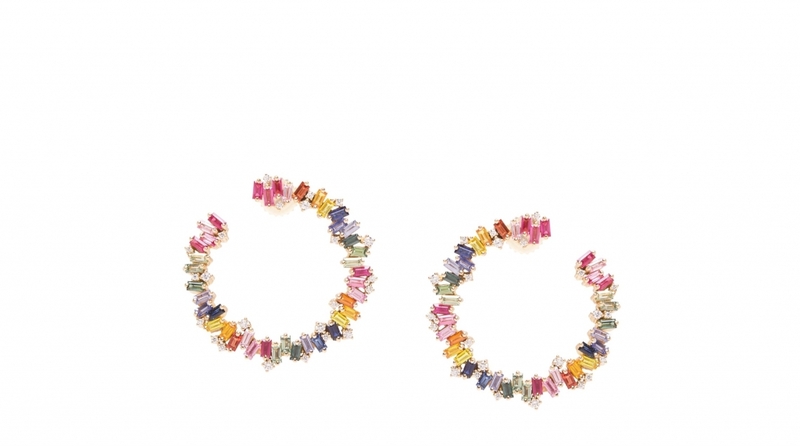 Enter her new Cascade Fireworks and Rainbow Sapphire Fireworks collections. What’s new in the Cascade version of Fireworks is movement by way of playful dangling charms on layered styles. While the designer “changed the perception of how baguette diamonds were traditionally used” in Fireworks, she explains, she took the idea to another level by making the offset stones mobile. “Baguettes are stunning with movement and can be delicate while making a statement,” she adds. In Rainbow Sapphire Fireworks, meanwhile, the looks are—as the name suggests—baguette cuts of colored sapphires. Not surprisingly, they, too, are a hit. “Customers love the happy colors,” says Kalandjian. Plus, sapphires are rarer than many other gems (think amethyst) so that equates to pieces with greater inherent value as well as durability—sapphires are a 9 on the Mohs scale of hardness. Pretty, strong, and precious? 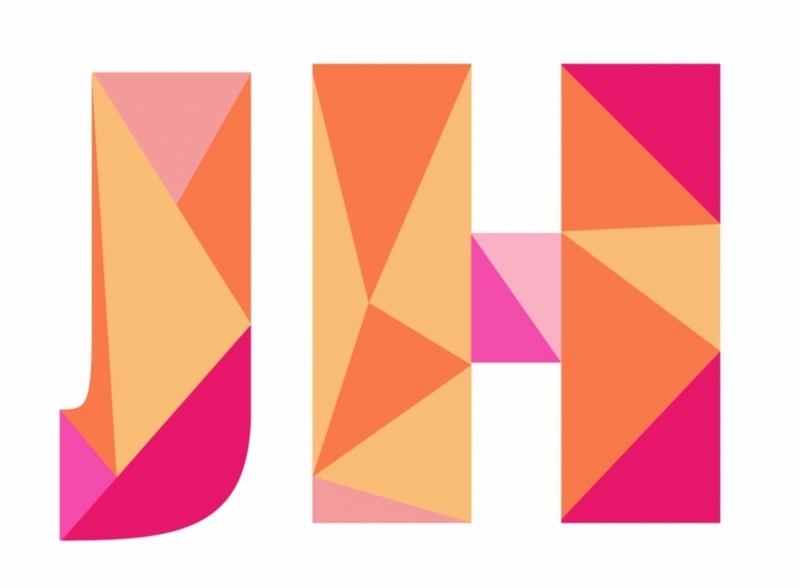 Sign us up, and keep the designs coming.